In 2013 internationally-renowned artist Barbara Rae CBE RA RSA began a series of journeys of discovery into the Arctic, following in the footsteps of her namesake, the Orcadian explorer Dr John Rae. The resulting new body of paintings, monotypes and intaglio prints represents Rae’s deep-rooted fascination with the topography and history of place. Rae joined her first voyage to the Northwest Passage travelling with One Ocean Expeditions in 2015. She returned in 2016 and 2017, drawn by her interest in the story of John Rae. The exhibition draws parallels between Rae’s journey and that of John Rae and shows how their paths intertwined. From her starting point on John Rae’s home isle of Orkney, Rae travelled to Greenland and Canada, voyaging through some of the most inhospitable places on earth. The sketchbooks of both Barbara Rae and John Rae will be displayed side-by-side, forming congruent narratives in these remarkable journeys. 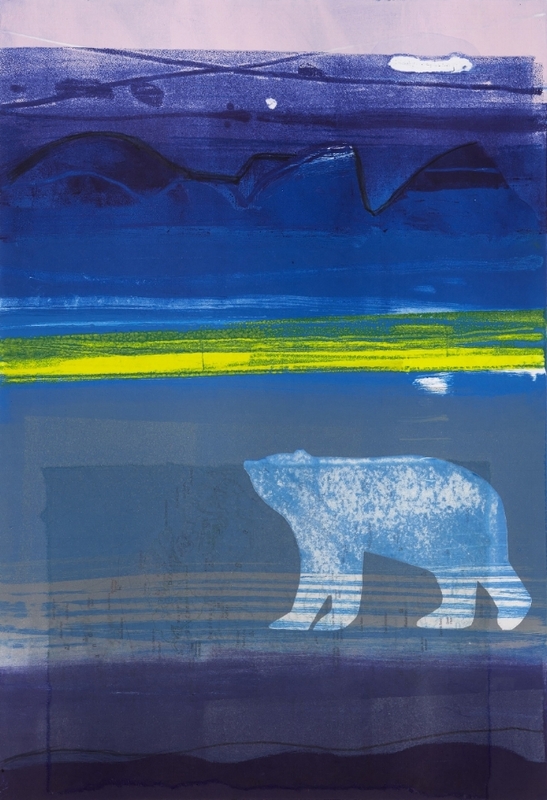 Whilst her paintings and prints are known for their rich, Mediterranean palette, Rae’s expedition to the Arctic has triggered a shift towards deep blues and opalescent silvers, but the intense bursts of colour for which her work is known remain resolutely powerful. The formidable unknown into which John Rae ventured on his Arctic voyage is seen in representations of fracturing ice and looming icebergs. Ice flows are translated into effervescent streams of colour and the scarce signs of life – huts, boats and fish – emerge in earthy browns and greens. The exhibition shows one of the foremost British contemporary artists to have chartered a new, painterly journey of exploration by looking to back into history. The exhibition will premiere at the Royal Scottish Academy before travelling to the Pier Arts Centre, Orkney, and Canada House, London, in autumn 2018. The exhibition is a collaborative partnership between the Royal Scottish Academy (RSA) and the Royal Academy (RA), London, in celebration of the latter’s 250th Anniversary year in 2018. The exhibition is funded by the Royal Scottish Academy of Art and Architecture with assistance from the Art Fund, the Morton Trust and Tony McLellan. The exhibition is sponsored by One Ocean Expeditions. A beautifully-illustrated book, published by the Royal Academy, will be launched alongside the exhibition. Dr John Rae – Born in Orkney in 1813, John Rae trained as a surgeon in Edinburgh. In 1833, he signed on for a short term with the Hudson Bay Company in Canada. Captivated by the landscape and lifestyle, Rae stayed with the company until 1856. Throughout his life he continued to work on several major mapping and charting projects in Canada. Despite locating the North West Passage, Rae was the only one of his contemporaries not to be knighted for his Arctic achievements. He died in London in 1893 aged 79, and is buried in the churchyard of St Magnus’ Cathedral in Kirkwall, Orkney.